It’s obviously hard these days to ignore the Web2.0 phenomenon (although the term still causes me to cringe), and the labels given to the forthcoming Semantic Web (the “real” semantic web or web<put your version number here>). See Mike Bergman’s post Please, Squash that Web3.0 Cockroach if you want to gauge a common reaction to the latest buzz word o’ the day attached to new technologies. Nonetheless, it’s interesting to see the memes that sometimes burst onto the collective web consciousness, and take on lives of their own. Social Networking virtually popped out of nowhere starting early Sept ’05. And apparently it’s more popular in India, Singapore, and New Zealand than the United States. Web2.0 was born on Sept 30th 2005 when Tim O’Reilly published What is Web 2.0: Design Patterns and Business Models for the Next Generation of Software. Since then, there’s been a plethora of “Web 2.0” applications and sites. And, there’s been no shortage of controversy of what “Web 2.0” actually is. 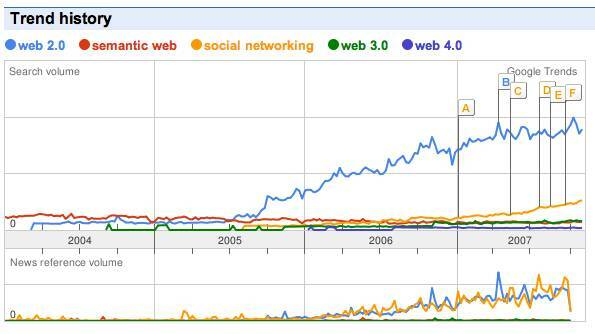 Lack of definition or not, Web 2.0 doesn’t appear to be going anywhere anytime soon.